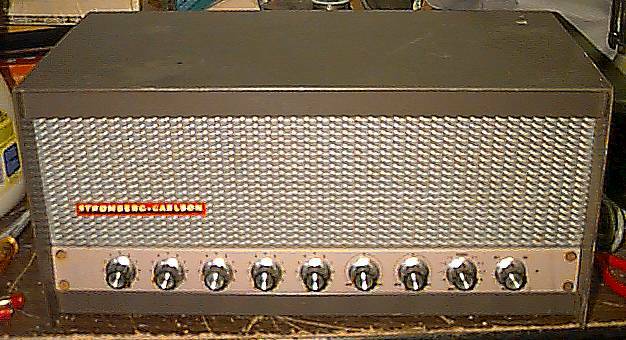 A good canidate for conversion is the 50 watt Stromberg-Carlson APH1050. 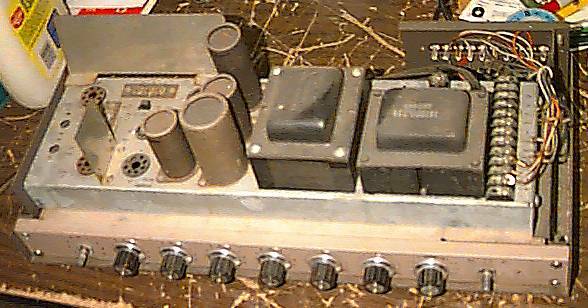 Here we see that the unit often comes encased in an enclosure with an SCP-1005 Mixer/Preamp and a rear terminal panel. The UAC-3 has a very nice Stromberg-Carlson logo, which we covetously have preserved. These cabinets contain even more extra goodies which are very useful for the thrifty electronics experimenter. 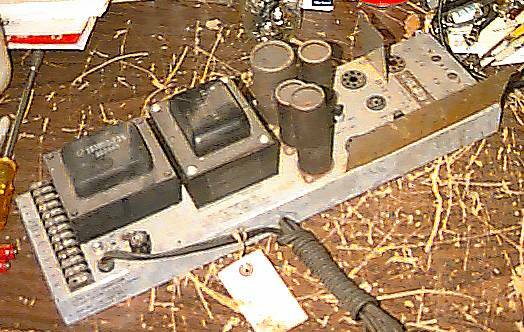 These were bought from Nortex Electronics. The UAC-3 top cover now removed from the UAB-1 (rear view). 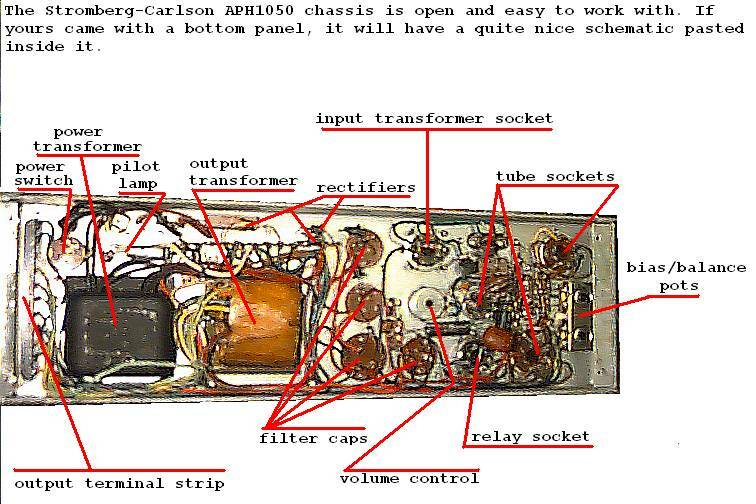 Note the nice 'rack ears' on the sides of the APH1050 chassis. All APH1050 have predrilled holes for these ears. '1050's found in the UAB or alone often have bottom covers as well. The bottom cover usually has a nice schematic. The UAB-1 is actually a litte rack in itself! The rackmountable solid state SCP-1005 Mixer/Preamp accepts 4 channels of microphone or line level signals, plus one extra phono channel, and is rated at 1.2V RMS output into a 50K load. I have gone through about 20 of these, and all they ever seem to need is maybe a coupling capacitor or two. They are great for general use, although a bit noisy for Hi-Fi buffs. They have a switched outlet on the back too. The rackmountable rear panel found with the UAB-1 immediately suggests good uses. The heat shields stick up from the chassis, and were to protect the optional audio input transformer and cabinet back from heat. 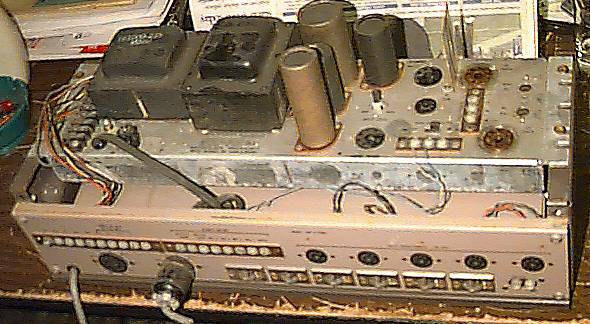 They were removed, since no input transformer will be used, and the amplifier will be in free air. 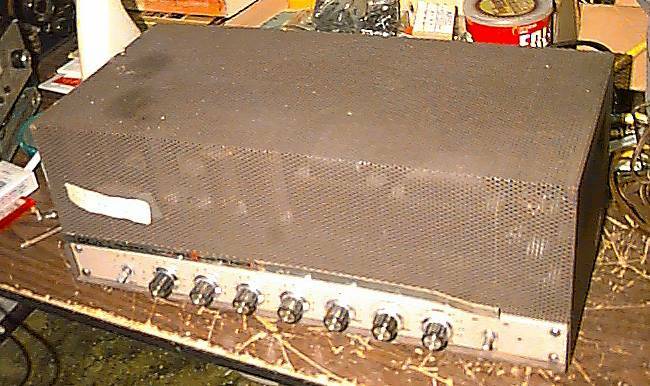 The amplifier is very dusty, and there is some surface oxidation, so it will be meticulously cleaned with a mixture of alcohol and a mild detergent solution, using an old toothbrush or a scotchbrite pad to loosen the dirt and smooth away any rough areas, then again with alcohol and a rag to completely clean the chassis. 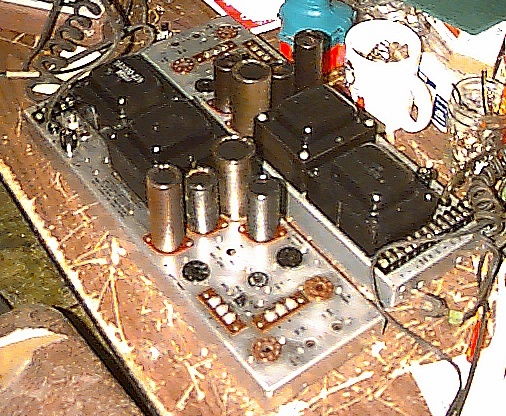 Then the tube sockets will be covered and the connection screws tightened, and the top of the amplifier given 2 light coats of clear enamel spray paint. After each coat, the unit will be ovened at 140 degrees F for 6 hours. The effort will be worth the results, making the chassis shine beautifully while preserving the amplifier's historical credentials and the patina of age as shown by the lighter and darker areas on the galvanized steel chassis. The APH1050 has plenty of room under the chassis, and is easy to work with. It is audibly rewarding to perform an electronic upgrade to the amplifier, after which the sound will be unbelievably excellent.